Why is C-3PO's name changed? Does the original droid designation not work en francais? I can understand the shuffling of R2D2's name. Was the grey imperial soldier ever released as a 12 inch? Alphacentaurian, in Italian R2D2 became C1P8 (Ci-Uno-Pi-Otto), and C3PO was 3BO (Tre-Bi-O). JD... sadly no. You can check out the original catalog showcasing the full line of 12" figures right here on Plaid Stallions, courtesy of our gracious host. Super props to the French photographer, btw. He put some serious industrial light and magic into that shoot (pun intended). Leia in 12" looks astonishingly life-like and genuinely happy while Luke looks more emotive as a "doll" than he did as an actor. It's probably no coincidence a French catalog added a bit of romantic frisson by making it appear the 3.5" Luke 'n Leia seem to be holding hands. Gorgeous, gorgeous lay-out. Love those vinyl capes. To this day the smell of fresh vinyl reminds me of being five again and tearing open the plastic blister-pack on somebody like Vader or a Jawa. Sorry, maybe I'm not being clear. 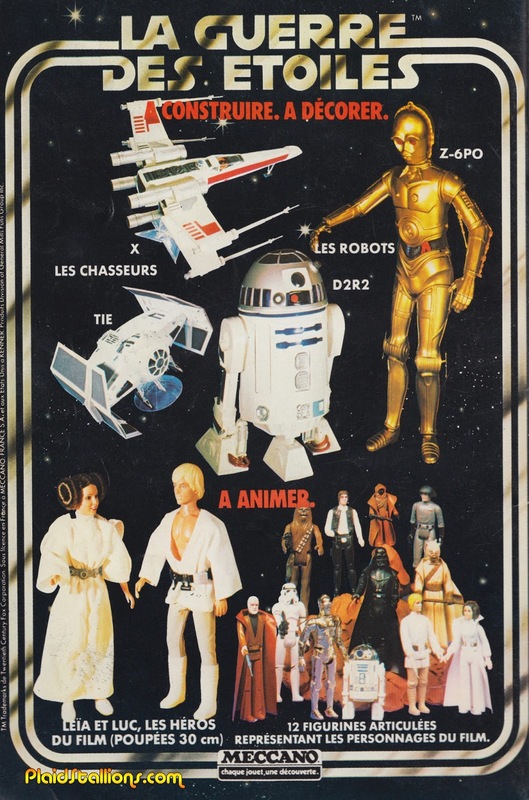 I didn't mean that the actual action figures were called "C1P8" and "3BO" here in Italy, only that, in the Italian dubbing for the movies, the droid's names were replaced. As for the action figures, I still have a few cards, in my "return of the Jedi" Boba Fett card the little droid is called R2D2. The Marvel comics italian translation, anyway, used the italian form. Tha action figures for "Return of the Jedi" were packed in what I guess was the U.S. / U.K packaging, with only a sticker reporting the Italian importer (Parodi).